When POET announced in 2007 that Project LIBERTY would use corn cobs to produce cellulosic ethanol, they knew it would be an uphill climb to collect the feedstock. Looking at the history of comparable collection projects, POET researchers only found one. And that project – in which just 50,000 tons of biomass was collected in Iowa in the late 1990s – was discontinued after one year. In order for Project LIBERTY to be fully operational at commercial scale, POET would need to collect 285,000 tons of corn cobs annually in the Emmetsburg, Iowa area. In 2007, POET partnered with a single farmer – Darrin Ihnen – and tested collection methods on 4,000 acres of his Hurley, South Dakota land. They retrofitted combines to collect both cobs and broken cobs and towed specially-designed cob collectors behind combines. While the processes may have been cutting edge, the results often created more questions than answers. When it came to the production side of cellulosic ethanol, much of POET’s initial work had been based on extracting ethanol from corn cobs. After similar cob collection and transportation issues in 2008, the team knew they needed a new direction. Project LIBERTY was a year away from requiring 50,000-plus tons of biomass for its first large-scale test run. POET, in its most productive year, had only collected 15,000 tons. While farmers regularly bale stover (the stalk, husks, cob, and leaves left in the field following harvest) for animal feed, these bales contain too little cob and too much stalk and ash for Project LIBERTY. 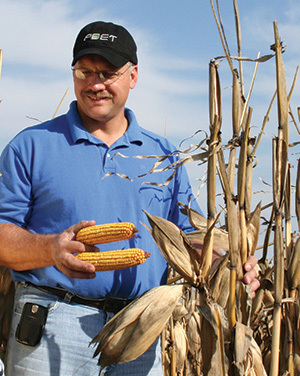 “In 2009, one of our team members, [POET Commodities Manager] BJ Schany, devised a bale-based method that collected a higher percentage of cob and less stalk and ash,” says Wirt. That bale-based process, called EZ Bale™, allowed farmers to collect biomass with a traditional combine and baler and store it like hay or straw. In testing, EZ Bales contained nearly four times the amount of cobs as a traditional stover bale and required less nutrient replacement. EZ Bales proved better for farmland and also may increase future corn yields. “If you want to talk about one major shift that moved us in the right direction, it’s the day we committed to EZ Bales,” says Wirt. In 2010, POET collected 56,000 tons of biomass from 85 farmers who could now deliver to Project LIBERTY’s new, 22-acre stockyard. EZ Bale allowed farmers to bale biomass in round or square bales and to store the bales in various configurations. While the tonnage increased dramatically, it was the buy-in from growers that moved the collection process forward. While 2011 and 2012 saw steady increases in biomass collected (63,000 and 72,000 tons) and continued improvements in the collection process, the biggest breakthroughs came in the increased options and ease for farmers selling biomass. When it comes to the collection and transportation of biomass, farmers can choose from either the Grower Model or the Custom Model. In the Grower Model, farmers (or biomass collection agents) bale, stage, store and transport biomass. In the Custom Model, the grower harvests the grain and forms the windrow, then simply calls POETDSM who takes over from there. Last year’s biomass harvest produced 110,000 tons, and 2014 is expected to reap 285,000 tons. That original farmer, Darrin Ihnen, has seen firsthand how POET’s biomass collection process has improved in the last seven years and changed farming.